Artist Alice Aycock (1946- ) created this sculpture, which is made of painted steel and wood. The artwork stands at 20' high in the Lorado Taft Drive near the Education Building. 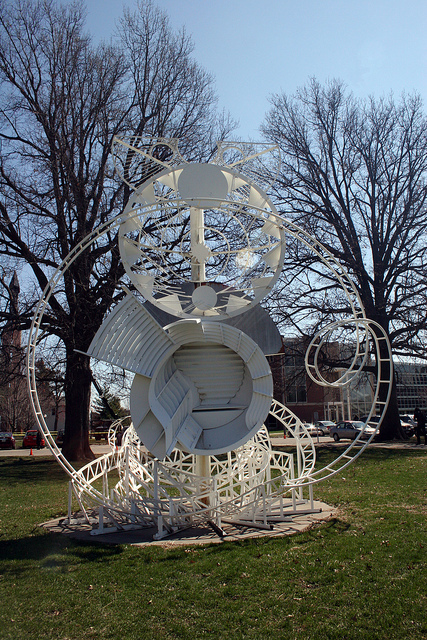 The artist gifted the piece to the University in 1992. Aycock's Tree of Life Fantasy appears on the landscape as an intriguing machine or play apparatus that gives no hint of function. 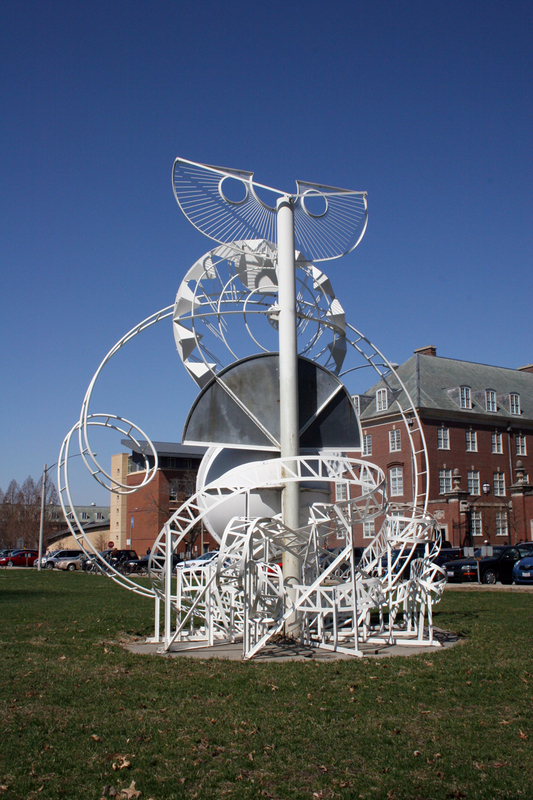 The painted white sculpture is at once a mix of opaque, transparent, and linear parts: kinetic roller-coaster loops, washboard and trellis forms, and jagged edges. Although created in three dimensions, only its front, sited straight toward the viewer coming from the west, seems significant. The work's full title is "Tree of Life Fantasy: Synopsis of the Book of Questions Concerning the World Order and/or the Order of Worlds." Meaning is elusive, yet in the context of themes explored in the artist's prodigious body of work, her fantasies, paradoxically, make sense. Involved are arcane musings on nature, philosophy, chance, magic, myth, technology, science, literature, history, psychology, dreams, and memory-imagined or real. As Aycock put it, her art represents "investigations into the process of visualizing and constructing pseudo-philosophical theories to explain the inexplicable phenomena of the universe." As if to reinforce that notion, her earthworks, constructions, and drawings typically bear enigmatic titles, ranging from 'How to Catch and Manufacture Ghosts' and 'The Large Scale Dis/Integration of Microelectronic Memories' to 'A Salutation to the Wonderful Pig of Knowledge', 'The Machine that Makes the World', and 'Angels Continue Turning the Wheels of the Universe Despite Their Ugly Souls'. "I just attempt to deal with what is around me," she once asserted. "I've always been interested in history. It's also necessary to play with science." The question of what we need to know to understand a work of art comes into play here. How important are titles? How much must we know of Aycock's style, iconography, thought processes? Does it help to learn that her imagery derives from pictographs, hieroglyphs, magical emblems, board games, alchemical signs, tantric art, stage sets, dance diagrams, archaeological remnants, and even the structure of DNA? Must we know that she said that this particular work had associations with industry, with architecture, with cosmology, with nature, and with speculations of early mystics about universal spiritual and physical truths? That she described it as "a nostalgic piece, a wish that the world could be ordered just like this"? Aside from matters such as aesthetics or artistic sources, can we not comprehend the sculpture solely as an interesting, if baffling, assemblage of disparate elements? Aycock is an artist of solid reputation whose work has received much critical attention. She has taught at Yale University, the Rhode Island School of Design, Princeton University, and Hunter College of the City University in New York, and her work is included in the permanent collections of the Museum of Modem Art, the Guggenheim Museum, and the Whitney Museum, New York; the Hirshhom Museum, Washington, D.C., and the University of South Florida, Tampa. Muriel Scheinman, “Tree of Life Fantasy, 1990-1992,” ExploreCU, accessed April 22, 2019, https://explorecu.org/items/show/25.